1979: Reports arise from country NSW, Australia, that a farmer-harpsichord maker working in Barraba, Bill Bright, aged 33, is becoming world-famous. Now he is being referred to as "renowned harpsichord maker". Bright works alone and began his new career after a back injury received in 1970. He uses poplar from Snowy Mountains trees and each instrument takes 3-4 months to create. They cost around $7000 and most of his orders come from overseas clients. Bright for a time studied instrument-making with Rainer Schutze in Heidelberg, Germany. 1979: Touring Australia, Gustav Leonhardt, "the world's finest harpsichordist". Critic Iain Shedden of The Australian newspaper feels that with popular music, the 1980s was a decade of style-over-substance, but all the same it refuses to die. Another unnamed critic Shedden quotes had the view that the 80s were the most despicable decade in the history of pop music! 1980: Birth of singer Christina Aguilera. 1980: Tamworth: Staging of The Australasian Country Music Awards are moved from Tamworth Town Hall to a large circus tent seating 4000 people. Within a year or two the number of fans attending the Tamworth festival rises to about 30,000 visitors. 1980 update on Australia's famous guitarist brothers, Tommy and Phil Emmanuel, from Gunnedah, near Tamworth, as they move to the top of their profession. Tommy is on the verge of international recognition after being signed to be managed by Glenn Wheatley (the man behind Australia's international success band Little River Band). Tommy has lately been working with Doug Parkinson's Southern Star Band and is now working on a solo act. Phil meantime has been playing with Gold Rush. 1980: Tamworth: Establishment of radio show on 2TM, Country Muster (live monthly) as part of further promotion of Tamworth country music festival. Also, inaugural Cavalcade, an increasingly large parade of floats, held on the last Saturday of the festival. January 1981: Tubular Bells multi-instrumentalist Mike Oldfield lately releases new album, QE2. With African drums/timpani from Mike Frye and drums from Morris Pert. Some of QE2 is a bit monotonous but on the album, Oldfield plays: synthesisers, mandolin, guitars, banjo, celtic harp, drums, timpani, piano, claptrap, vocoder, chair (? ), marimbas, vibraphone, tambourine, Northumbrian bagpipes, Aboriginal rhythm sticks [click sticks?]. Wow! 1981: HoTM's old archives reveal an AAP story from Los Angeles Herald Examiner, sometime in 1981, that up to 12 previously unreleased Beatles songs are held in "vaults in England". One informant has been Ken Townsend, a spokesman for Abbey Road Studios, London; another is Brian Southall, a spokesman for EMI Records in London, which has four unreleased Beatles tracks. Southall thought Lennon with Leave My Kitten Alone might be released in 1982 or 1983. (This track was due to be released last year but the plan was cancelled due to Lennon's death.) One track in EMI's vaults is the Mitch Murray song, How Do You Do It?, the first song The Beatles recorded as a single, later released to be a hit by Gerry and the Pacemakers. 1981: Revolutionary social change via creative use of media catches on in France as Paris alone finds it has 60 new radio stations, many of them privately-owned. Till now, France has mostly had only radio and TV stations run by government - plus three illegal stations which were regularly raided by police. France in 1981 after election of President Mitterand now has 300 (illegal) private FM radio stations. By September 1981, hopes were there would be 400 such stations, for ethnic minorities, minority interest groups, news stations. New legislation was planned to guide activities by law by October 1981, and till then, government from time to time might jam stations' broadcasts. France's communications ministry is expected to regulate that stations can use only 100 watts power (enough to cover one city), cannot run advertisements and must not form networks. 1981: US composer Christopher Yavelow receives grant to compose a three-act grand opera, The Passion of Vincent Van Gogh. Yavelow later becomes a noted world expert on systems for producing electronic/digital music. September 1981: By now the computer is an essential tool for business and technology work. Now it is moving into music performance, as shown by a recent performance of German musicians, Kraftwerk, in Sydney and Melbourne. The band members (spokesman Ralf Hutter) are neither classical nor pop in their musical outlook, and regard their performances as "a set of convictions about new technologies". Some of their computers are custom-built for their purposes, which might use home computers (available only five years ago) fitted with rhythm devices, to custom-built mainframes, digital and analogue devices as modified to become musical instruments. The band travels with a computer engineer who connects, administers and improves. The band even does things such as walk about a stage using hand-held music terminals, such as modified standard pocket calculators (fitted with music programs) which they found in an ordinary department store toy shop, costing $15. Ralf Hutter predicts that "the eighties will belong to the computer", and rejects perceptions that computer-generated music is "hard, cold and unfeeling", as he points out that all musical instruments are simply machines. And Kraftwerk's next move technically? To shorten the lags occurring between the inspiration for a new computer-music theme and the time it takes for the commands to reach the machine producing particular sounds. The Australian newspaper, Computers column by Douglas Moore, 29 September, 1981. October 1981: Jazz in Australia holds its first national conference, in Brisbane and hears bad news: government funding for jazz has fallen 66 per cent below funding provided in 1975. Will the jazz boom decline? Government has imposed a user-pays policy. The bands most successful at gaining sponsorship have been Galapagos Duck, The Daly/Wilson Big Band and a saxophone group, Super Saxes. (Meanwhile, HoTM's archives find that by November 1980, The Australian Music Centre was reportedly revealing its "grave financial problems". 1982: Malcolm McLaren issues hit single, Buffalo Gals, the first song to feature "scratching", a white person expropriating "hip-hop culture". McLaren follows up with hip-hop album, Duck Rock, a harbinger of the coming rap explosion of the mid-1980s. 1982: US hip-hoppers Grandmaster Flash release The Message. 1982: Tamworth: Establishment of Pro Rodeo plus music industry seminars as part of further expansion of Tamworth country music festival. Also, inaugural Cavalcade held on the last Saturday of the festival. 1982: Malcolm McLaren issues hit single, Buffalo Gals, the first song to feature scratching, a white person expropriating hip-hop culture. McLaren follows up with hip-hop album, Duck Rock, a harbinger of the coming rap explosion of the mid-1980s. 1982: Michael Jackson issues LP Thriller, regarded as the best-selling album of all time, a mix of soul, funk, rock, disco and ballads. It charts for two years. Item - 1982 - PHILIPS COMPACT DISC – a wonderful invention! Requests from the sports broadcasting industry for instant replays in the early 1960s set manufacturers on the road to today's DVD technology. Philips intervened in this market with its LaserVision video disc in the early 1970s. Despite years of development, however, the LaserVision did not offer any significant advantages over the recently introduced video cassette, and had no recording capability. In 1978 Sony teamed up with Philips to develop a standard, universal compact disc to hold audio and finally in 1982, a prototype compact disc (CD) emerged, heralding the birth of the digital revolution. Unlike the audio cassette and vinyl record, the CD was not subject to mechanical wear, and it produced a distinctly richer sound than the average record, especially for dynamic music styles such as jazz and classical. With a diameter of just 11.5 centimetres, each CD comprises a thin, highly reflective metallic layer pierced by a series of pits of varying lengths on the readable side of the disc. A thin layer of acrylic and a thicker layer of durable polycarbonate protect these pits. Each pit appears to the laser that reads the disc as a slightly-raised bump of a certain length, corresponding to a predefined value, linked to a rapidly changing series of digital signals which are translated into images, sounds or data. The prototype was adjusted in size to accommodate the whole of Beethoven's Ninth Symphony, with the final commercial version offering 77 minutes of music, significantly longer than a double-sided LP. Further technological advance has produced a CD that can store increasingly large amounts of data that are easily recordable, error-free and reproducible. Individual segments of content can be located without laboriously sifting through mountains of information and new forms of interactivity and education have been shaped. The easy retrieval of data makes possible risk-free archiving and sharing of information. While common terminology may differentiate between a music CD, a DVD and a CD-ROM, all three are conceptually identical and remain largely unchanged since the very first compact disc appeared. 1983: Australian country music singer Slim Dusty (died 2003) becomes the first singer in the world to have a voice beamed to Earth from space, when US astronauts Bob Crippen and John Young play Dusty's version of Waltzing Matilda from the space shuttle Columbia as it passes over Australia. By now, trend-wise, rap and hip-hop music are beginning to break through into mainstream musical culture. 1984: Introduction of Macintosh computer, later found useful for music composition/music-handling tasks, partly due to being wonderfully graphics-based. 1984: Electronic music: The Macintosh computer appears, and with it, a first Macintosh music product, Hayden Software's Music Works, as created by Jay Fenton (who later programmed VideoWorks and VideoWorks Interactive, which latter was used by Apple to guide authoring with its interactive animated guided tours and then evolved into MacroMind Director). At this time, the Macintosh emphasis is on score editing, seen as more important than other use of Macintosh's internal four-voice synthesizer. By the end of 1984 there are appearing some early-generation music notators, as with Mark of the Unicorn's Professional Composer (with score editing and printing capabilities). Soon came Great Wave's Concertware, Utopian Software's MacMusic and Triangle Resources' MusPrint. Products such as Concertware, MacMusic and MusicWorks tried to integrate use of Macintosh's internal synthesizer and score editing into single software packages. See Christopher Yavelow, MacWorld: Music and Sound Bible: The Definitive Guide to Music, Sound and Multimedia on the Mac. (Foreword by Herbie Hancock) San Mateo, California, IDG Books International, 1992. 1986: Beastie Boys produce License to Kill, the first rap record to hit #1 in US. 1986: Peter Gabriel issues album, So. 1986: Group Beastie Boys are sued "for thieving guitar riffs" for their album, Licensed to Ill.
1986: Elvis Presley is among the first ten artists inducted into The Rock 'n' Roll Hall of Fame. 1986: Founder of the legendary Sun Records, Sam Phillips, is entered into the Rock 'n' Roll Hall of Fame in 1986. Phillips produced Presley's first record, the 1954 single That's All Right (Momma too). But after four more singles Phillips sold his contract as Elvis' manager to major label RCA records for $35,000 (£21,700) to help clear debts accumulated by Sun. Late 1986: Electronic music: Adobe Systems releases its now-famous Sonata font of PostScript music symbols. But some disillusionment was a result for many seriously wanting to print out music, although this move ended the first generation of Macintosh musicware and began the second generation (1987-1989). This first-second generational move saw the ushering in of: MIDI sequencing software with 16 and later 32-bit channels, patch editing and sample-editing software for specific devices, interactive compositional packages, various music-educational software, MIDI programming languages, Notation software utilising PostScript and MIDI, and recording direct-to-hard-disk using external, peripheral devices, not internal computer cards. By 1988, the use of the computer's own metronomic tick to aid composers was replaced by an approach to quantization which allowed the music programmer/writer to play with rubato, expressive slowing and quickening. 1987: Prince issues album, Sign O The Times. 1987: US composer Christopher Yavelow is commissioned to produce a Macintosh-computer-controlled opera about nuclear war - Countdown. 1987: Prince issues album, Sign O' The Times. p>1989: Beastie Boys issue album Paul's Boutique. 1989: US: Hip-hopper has debut album, Stone Cold Rhymin'. 1989: Beastie Boys issue album Paul's Boutique. See Anthony Baines, (Ed. ), Musical Instruments Through The Ages. London, Faber and Faber/Penguin, 1961. 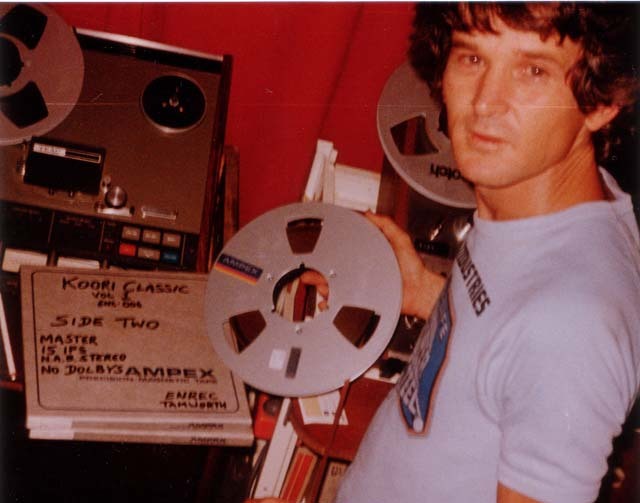 About Enrec Records: Ed Matzenik in the 1980s lived in Tamworth NSW (Country Music Capital of Australia) and helped with Steve Newton to manage Enrec Records. One of the recording studio´s projects was recording Aboriginal artists singing country music. Here is Ed with an original recording lately re-issued in 2012, titled Koori Classics. One of the unearthed singers at the time was Sarina Andrew, who received quite a bit of press coverage at the time. Picture courtesy of Ed Matzenik.